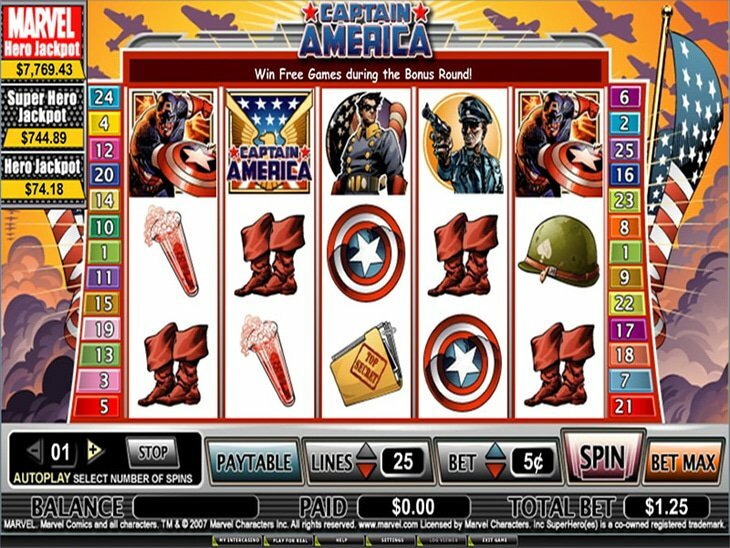 Captain America Is Back In Town With Playtech & A Brand New Game! For those of you out there that are fans of comic books and slot machines, as they say, boy have I got something for you. No less than a brand spanking new all singing and all dancing Playtech slots game. I lie not and guess what? You'll never guess what it's called, well maybe you will, hey, wanna know what it is? It's Captain America! Yes, one of America and Marvel comics' most exciting legendary figures springs back to action with this marvellous Marvel - themed game, compliments of gaming developers Playtech. With 20 paylines across 5 reels the player can play for as little as $0.20 or right up to $100 a spin. The game takes the player back to the second World War and the times of Red Skull, the head of weaponry for Adolph Hitler. Our hero's alto ego is centred on an ailing Steve Rogers, who once he's left the military transforms into Captain America an All American Super Soldier. The action's represented in the form of max 16 free spins, continuous re-spins, Wilds, Expanding Wilds, huge multipliers and big, Super Spins. Maybe you're a slots enthusiast that likes to know a lot about the games they're about to go on without squandering a lot of hard earned cash. If that is the case why not jump on this latest Playtech offering and test it out on free play? It's a great way to check it out in depth and there's a limitless amount of plays too, so you can just keep playing till you've gone through as many different sequences as time allows, and then if you wish come back again later, pretty cool eh! What are you waiting for, Captain America is getting fidgety, it's time to bring on the action, get started now!